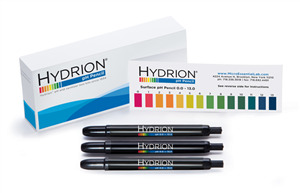 The Hydrion Mechanical pH Pencil measures the pH of any surface to the nearest full pH value. 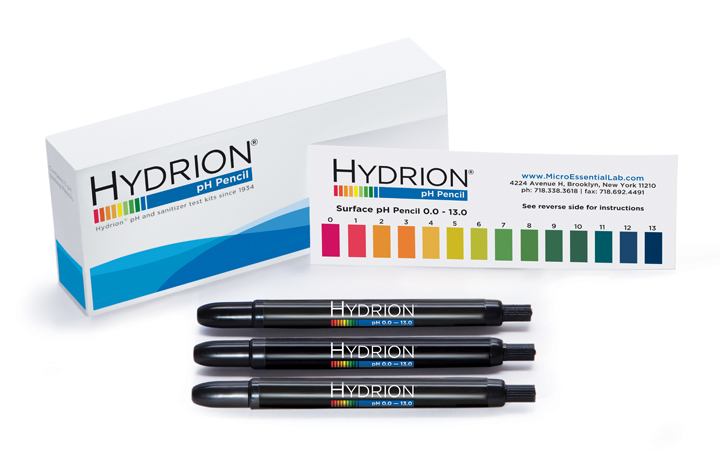 The Hydrion pH pencil can be used to test irregular or uneven surfaces, and is also effective on porous material and impervious solids. It offers clear bright single color matches at every 1.0 interval from pH 0.0-13.0. Packed 3 pH Pencils per box. To measure the surface pH just wet the surface with distilled water. Stroke the surface with the pencil. Wait approximately 15 seconds and compare the resulting color change with the color chart.